This is an biography (timeline) about a woman of power & intelligence named Josephine Baker! 1906 June 3rd Birth of Freda Josephine in St. Louis, Missouri. In 1919, she marries Willie Wells. and in 1919 she separated Willie Wells. In 1919, she joined the Jones Family Band Stage debut at the Booker T. Washington Theater, in St. Louis. In 1920, she dresser for Clara Smith in the Dixie Steppers and in 1920, she marries Will Baker. In 1921, the month of April she was in Chorus Girl in the Dixie Steppers in Philadelphia. In 1922, the month of August Josephine Baker joined the Shuffle Along in Boston. In 1923, she also joined the Caroline Dudley's troope and in 1925 September 22nd she went to France. In 1926 she met Pepito Abatino and in 1926 December she opened Chez Joséphine, in Pigalle 1927 Starred in The Tropiques. In 1928 to 1930 The World Tour opened at the Casino in Paris and in 1930 Henri Varna bought her a leopard. She became a French citizen in 1937 when she married Jean Lion, and then in 1940 she divorced Lion. World War II she became a Red Cross nurse. In 1940 the month of December Josephine Baker appeared in The Créole, in 1940 she was awarded the Croix in Guerre and then in 1940 she was awarded the Légion d'Honneur. In June 1947 she married Jo Bouillon and in 1950 she adopted orphaned babies at her estate of Milandes, in the Dordogne. In 1957 she separated with Bouillon. On May 1959 she appeared in Paris at the Olympia Theatre, in Paris and on August 28th 1963 she took part in the Civil Rights march in Washington. In 1969 she was evicted from The Milandesand in 1969 and she was part of the Princess Grace in Monaco and Prince Rainier the third in Monaco and was offered a villa in Monaco. In 1973 she marries Robert Brady and in 1975 she performed in Princess Grace in Monaco and Prince Rainier III in Monaco and helped to put on the spectacle Josephine. 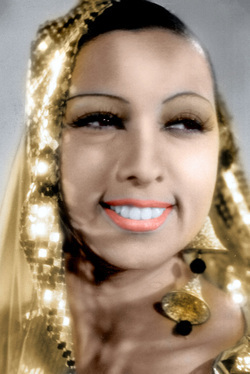 In April 12th 1975 Josephine Baker died.